My first trip down to Orlando, the long way. 15 Days, 3,590 miles. It was 2000, and everyone was taking computer security seriously, especially after that ridiculous Y2K fear mongering. So I was going to get myself to a SANS computer security conference, and check up on the latest intrusion protection and user authentication schemes. (SANS, which once stood for Systems And Network Security I believe, is one of the largest computer security awareness/conference/training organizations in the world now...) The previous two trips to a SANS conference were both in San Antonio. This conference would be in Orlando, Florida. Coincidentally (cough), a couple of friends would be in Tampa, and there were a few days between the end of their event and the start of mine. Hmmm.... What to do, what to do. Of course, Walt Disney World (and a few other Theme Parks) takes up a good portion of this web site, but it's noted here because this trip restarted a relationship with the parks that continues to this day. And so long as I was going to plan a few days at the theme parks, I decided that this conference might as well be a full blown Road Trip. The trip down and back from there, would be filled with a few planned stops along the way. There was only one thing I really had to do, however, and that was finish the Natchez Trace Parkway. One of my first stops was actually at Mammoth Cave National Park in Kentucky, but upon arriving I found that the next tour I could get on was a couple hours away, and the tour was four hours long. I needed to be in Nashville that night. So I got myself a coffee cup, a picture of the entrance sign to prove I was there, and split. Early the next morning I would wake up to a crappy, overcast, intermittently raining sky. Today, I would finish driving the Natchez Trace Parkway. I did the first half (Part 1) from Natchez to Tupelo in 1998, but had to end the drive due to a little back problem. Since the Trace goes more North-South than East-West, I would start "Part 2" from the Terminus (literally then end of the road) near Nashville, and travel Southwest to Tupelo, Mississippi. Mile Marker 0 is in Natchez. I would be starting from mile marker 442. The Natchez Trace Parkway (and the Blue Ridge Parkway) is all about the drive. There might be a destination, but if you're going to drive these roads, you get on it to enjoy the scenery, the trails and viewpoints, the relaxed pace and the history. It's not how fast you can get from point A to B. If that's your objective, take the interstate, or at least a real highway. One place I did stop at was the gravesite of Meriwether Lewis, who committed suicide at Grinders Stand on October 11, 1809. He was travelling from St. Louis to Washington D.C. to clear up some accounts. He was also a manic depressive, and by this time was an alcoholic and a drug user. A very sad ending for one of the pioneering heroes of this country. I would return in 2011, as sort of a final stop to my Lewis & Clark adventure in 2006. There are also more pictures (on a nicer day) from the gravesite to the Terminus. 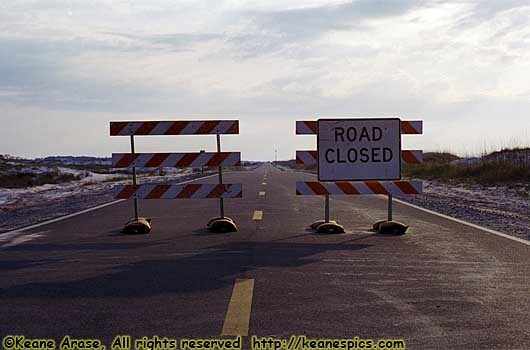 Road Closed. The story of my life. Florida State Route 399, Pensacola, Florida. 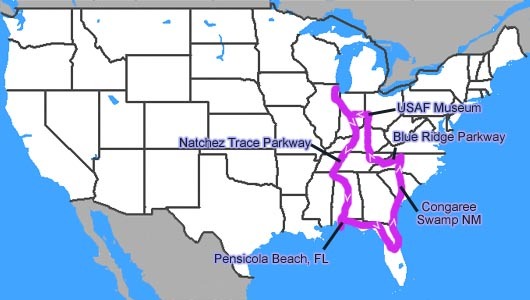 After reaching Tupelo, and satisfying my completionist side, I did a power drive to Birmingham and South to Pensacola. I got up early to take pictures of the Sunrise, and drove down to Pensacola Beach, to the Gulf Islands National Seashore. They actually close it at night, and actually gate it off. Bummer. The other reason for driving down to the barrier island was to drive County Road 399 down Santa Rosa Island, but they closed the road on me. Bummer again. After being forced back up on the Mainland, I hit mile after mile of small tourist towns and developments. I decided to bail from the coast and heat up to I-10, I still needed to be near Tampa that night. On the way toward I-10, I passed the US Air Force Armament Museum, on the grounds of Eglin Air Force Base. The museum wasn't open yet (things come in threes, don't they? ), but the outdoor exhibits were accessible. I picked up a friend in Tampa before driving to Orlando, and laughed at the seabirds that inhabit the bay and the pool. I hope they have a good filtration system. So you're in Orlando. What do you do? Disneyworld! I would be there for three days before my conference started, but that's another page. Click the thumbnail to go there. In addition to Congaree Swamp National Monument (which is now Congaree Swamp National Park, btw), I visited Fort Pulaski National Monument, but only took video. That's when I was still carrying my Nikon F3, and it wasn't worth carrying around both cameras. Too bad. It's an interesting place. Congaree Swamp was an interesting place too. There's a mosquito meter on the Ranger's cabin. It was set to low, so I took a walk around the place, following the boardwalks. This place has one of the last lowland old-growth forests, with some of the tallest trees in the country. Of course the Sequoias in Yosemite and the spruces in Olympic are much more impressive, but that's another page. The swamp floods a number of times a year, but not when I was there. It was a nice mile walk around the swamp. I'm not sure where I entered the Parkway in 2000, but I don't remember Grandfather Mountain or the Lynn Cove Viaduct. I do remember a number of places when I went back in 2007, though. I still need to explore Great Smoky Mountain National Park, though. Due to the fog and time I had in 2007 (and 2011, for that matter), I've never had the chance. Once again, in 2000, I mostly took video, and only took a couple of pics from the car, when the Nikon was handy. If you want to see more of the museum itself, see my National Museum of the United States Air Force at Wright-Patterson Air Force Base page under Other Stuff.